As Brennan hearing continues, don't know when committee - or full Senate will vote on him. There will be a closed-door hearing on Tuesday. President Barack Obama used his State of the Union address on Tuesday night to try to push past the fiscal battles that plagued his first term - and still threaten his second - as he laid out an agenda he hopes will shape his legacy. Obama's overarching message was that other things matter beside the Republicans' seemingly all-consuming drive for deficit cutting, embodied in a looming showdown just three weeks away over automatic across-the-board spending cuts. Obama: "Study after study shows that the achievement gap starts very young." 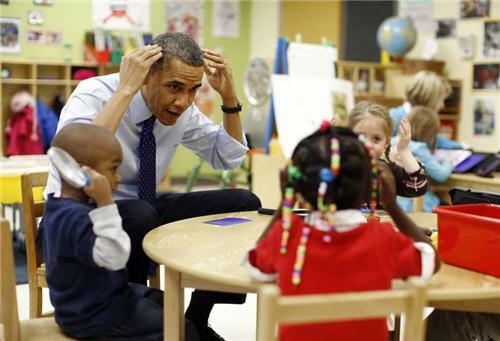 Obama: "Kids aren't stupid. They know when they're behind at a certain point... and they start pulling back." Obama: In states like Georgia that have made it a priority to educate our young children, states like Oklahoma... they are more likely to grow up and find a job, even form more stable families. Pres Obama says that's why he used his SOTU to propose making high-quality pre-school available to "every child in America." Obama: "This is not baby-sitting. This is teaching." Obama: "That whole 'playing well with others' is something we could use more of in Washington... maybe every once in a while have some quiet time, a time out." "If you're looking for a good bang for your educational buck, this is it – right here," Pres Obama says of pre-school programs. Obama: "Michelle and I remember how tough it can be to find good childcare. I remember how expensive it can be too. The size of your paycheck, though, shouldn't determine your child's future. So let's fix this." Obama, on recruiting teachers and use of education technology: Our commitment to our kids' education has to continue throughout their academic lives. Obama: We've worked to make college more affordable for millions already, but taxpayers can't keep subsidizing. Colleges have to do their part, and if they can't keep costs in check they should get less federal support. We released a 'college scorecard' to help parents, students compare and make education choices. Obama, on sequester: "This was all designed to say, 'We can't do these bad cuts, let's do something smarter'... unfortunately, Congress didn't compromise, they didn't do their jobs." Pres Obama says the sequestered cuts wont help the economy, wont create jobs and will inflict hardships. Obama is standing in front of first responder personnel whose jobs will be affected by sequestration cuts. #Jesse Jackson Jr. Walking outside of courtroom grabs my hand and tells me "tell everybody back home, I'm sorry I let them down, OK?" Education Secretary Arne Duncan introduces Vice President Biden before his keynote address at a Connecticut gun violence conference. "For me, the status quo is untenable," Duncan says of Newtown and other recent incidents of gun violence. "Together, we have to act." Mayor of Bridgeport Bill Finch, on hundreds of gun buybacks done since the Newtown shooting: "Ironically, the first gun we bought back was a Bushmaster." Plans to stimulate Japan's economy will mean more business for the United States and Asian neighbors, Japanese Prime Minister Shinzo Abe said in a draft of a speech to be delivered on Friday after talks with U.S. President Barack Obama. "Soon, Japan will export more, but it will import more as well," Abe said in the prepared speech to a Washington think tank. "The U.S. will be the first to benefit, followed by China, India, Indonesia and so on." Abe's pitch on pump-priming policies dubbed "Abenomics" also carried a warning that Japan would not bow to challenges to its sovereignty over tiny islets in the East China Sea that Tokyo controls but Beijing also claims. However, Abe said he did not want to escalate tensions in the territorial row with China. 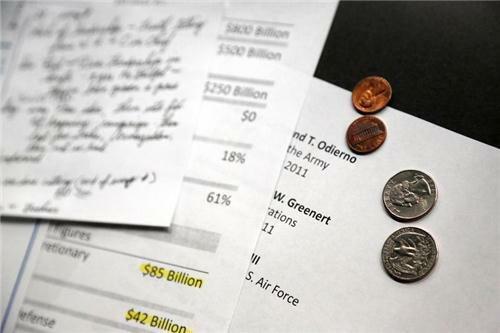 Prepare for sequestration -- those deep across-the-board federal budget cuts scheduled to start on March 1. Here is a rapid-fire look at where the cuts will fall and how they might affect you. Senate debate continues on S. 388, The American Family Economic Protection Act to "To appropriately limit sequestration, to eliminate tax loopholes, and for other purposes." This is the bill favored by Democrats; click here to read the WSJ's breakdown of Republican senators' alternative proposals and the plans from each party in the House. In the Senate, the divide right now is between a Democratic bill that replaces sequestration with a mix of cuts and tax increases, and a Republican plan to enact the cuts while giving the White House more flexibility over their makeup. Republicans have stood firm against additional tax increases in the wake of the fiscal cliff deal that raised taxes on wealthy Americans, and Democrats reject the Republicans' flexibility plan as a ploy to pin the full cuts on the White House for political purposes. 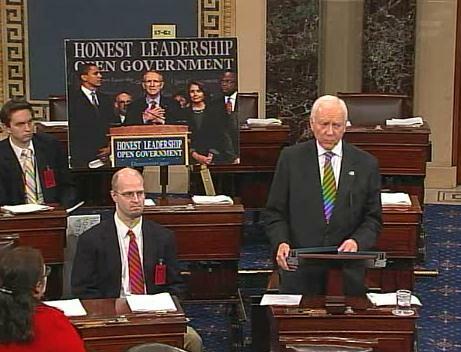 Today, Republicans in the Senate faced a choice about how to grow our economy and reduce our deficit. And instead of closing a single tax loophole that benefits the well-off and well-connected, they chose to cut vital services for children, seniors, our men and women in uniform and their families. They voted to let the entire burden of deficit reduction fall squarely on the middle class. I believe we should do better. We should work together to reduce our deficit in a balanced way – by making smart spending cuts and closing special interest tax loopholes. That’s exactly the kind of plan Democrats in the Senate have proposed. But even though a majority of Senators support this approach, Republicans have refused to allow it an up-or-down vote – threatening our economy with a series of arbitrary, automatic budget cuts that will cost us jobs and slow our recovery. Tomorrow I will bring together leaders from both parties to discuss a path forward. As a nation, we can’t keep lurching from one manufactured crisis to another. Middle-class families can’t keep paying the price for dysfunction in Washington. We can build on the over $2.5 trillion in deficit reduction we’ve already achieved, but doing so will require Republicans to compromise. That’s how our democracy works, and that’s what the American people deserve. For all the rhetoric, the impending $100 bln of federal spending reductions, however imperfectly chosen, won’t do much real damage to the growing economy. Uncle Sam’s outlays will still rise this year, and any impact will be short-lived and easily absorbed by the private sector. The International Monetary Fund said Thursday it will likely cut its growth forecasts for the United States and the global economy if automatic U.S. spending cuts take effect on Friday, and warned that the U.S.'s biggest trading partners would be hardest hit. "Sequestering was started by the president and the Republicans and the Democrats in Congress. All of them thought it was a great idea to make something that was so terrible you couldn't do it without ever thinking (about) what would happen if you actually did it." -New York City Mayor Michael Bloomberg, speaking on the PBS program "Charlie Rose" on the topic of upcoming sequestration cuts. The $85 billion in across-the-board "sequestration" cuts are expected to cause airport delays, disrupt public services and result in lower pay or layoffs for millions of government workers. What they are not likely to do, at least as far as financial markets were concerned, was cause enough damage to derail a U.S. economy that has lately been gaining momentum. As across-the-board spending cuts were to take effect for the U.S. government, bureaucrats on Friday were still trying to figure out how much wiggle room they have to limit the damage. WASHINGTON - The nation's largest employer, the U.S. government, has begun notifying its vast and varied workforce to prepare for reduced hours and slashed paychecks over the next seven months as big budget cuts that were once an abstraction became a reality Friday. After the financial crisis, the markets, the media and the politicians developed a fixation: Find the next black swan. That has led to a belief that any sign of stability, any indication that the worst may have passed is simply a false dawn. Luckily, that time has passed. WASHINGTON - President Barack Obama, who said just days ago that he had no interest in playing a "blame game," spent much of a news conference on Friday pointing fingers at Republicans after last-ditch talks with congressional leaders failed to avert automatic spending cuts from kicking in later in the day. WASHINGTON - New Defense Secretary Chuck Hagel vowed on Friday to preserve U.S. military effectiveness despite $46 billion in new defense cuts he said would jeopardize the Pentagon's ability to fulfill its missions effectively. It may not be readily obvious from the blizzard of news out there today on the “sequester,” but a government shutdown became significantly less likely today, even as the automatic budget cuts barreled ahead toward reality. What happened? Both sides – Republicans and Democrats – basically seem to have agreed that as they will continue to fight out the $85 billion in automatic budget cuts starting to take effect today, they will not allow that disagreement to jeopardize full funding for the federal government. That funding is now scheduled to expire March 27. President Obama, now facing the consequences of automatic spending cuts and the complications they raise for his broader domestic agenda, is taking the most specific steps of his administration in an attempt to ensure the election of a Democratic­-controlled Congress in two years. In the Washington Post, Ezra Klein examines the difficulties of Republicans and Democrats to consider each sides' policy proposals apart from overarching political considerations. On "Fox News Sunday," Ann Romney says that she believes the country would not be facing "sequestration" if her husband had been elected.